Dhankot Traders is engaged in manufacturing and supplying large array of Castle Nut that is made up high grade raw materials that guarantee the durability of products. Being one of the reliable Dealers and Distributors of Castle Nuts, we make use of cutting-edge technology, so as to meet the exact expectations of clients. So far, we are fulfilling the demands of numerous clients from India, Nepal, Sri Lanka, Bangladesh, etc., by offering our vast assortment of Castle Nuts in fine quality. Available in cost-effective prices, our products are extremely known for its customized and standard sizes. We have these Nuts in metric and inches dimensions that are mostly confirmed as per IS: 2232 and DIN 935 standards. 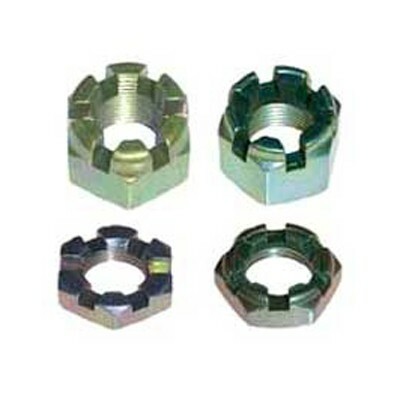 Also, we are renowned as one of the reliable Hex Castle Nut dealers in South India. Owing to such popularity and consistency, we are reckoned as one of the trustworthy Manufacturers, Exporters and Wholesale Castle Nut Suppliers from India.